From our 2 days in the Chinese Village we headed to Shenzhen- the nearest major Chinese city to the Hong Kong boarder. Shenzhen is a major hub for the technology sector with many of China’s social media brands based there- the Silicon Valley of China if you will. It’s grown out of its close proximity with Hong Kong, relaxed regulations and ability to attract talent from its more western neighbour. Shenzhen was really just a night stop before we headed to Hong Kong the next morning. The hotel wasn’t great and in fact smelt of insecticide- not a good sign. We ate at a local restaurant and ordered some of our favourite dishes (avoiding the braised turtle that was on offer). The following morning we crossed into Hong Kong. We took the land boarder and were efficiently stamped out of China and into Hong Kong (although no stamp into Hong Kong). The whole process including transfer to the city centre where our new hotel was, took 3 hours. We checked in and said goodbye to our companions from the past 3 weeks. After some down time we ventured out. First stop was food and locating our next hotel. The harbour light show started at 8pm and was timed to music. The skyline in Hong Kong is breathtaking and vast. It doesn’t have the imaginative and iconic buildings of Shanghai but none the less is spectacular, especially as it backs onto Victoria peak. We found a spot and defended it from the local tourists. The show was a little disappointing. Lasers and lights but there could of been a lot more given the number of buildings that line the harbour. We also spotted the ‘dragon boats’ sailing up and down the river with their famous red sails. 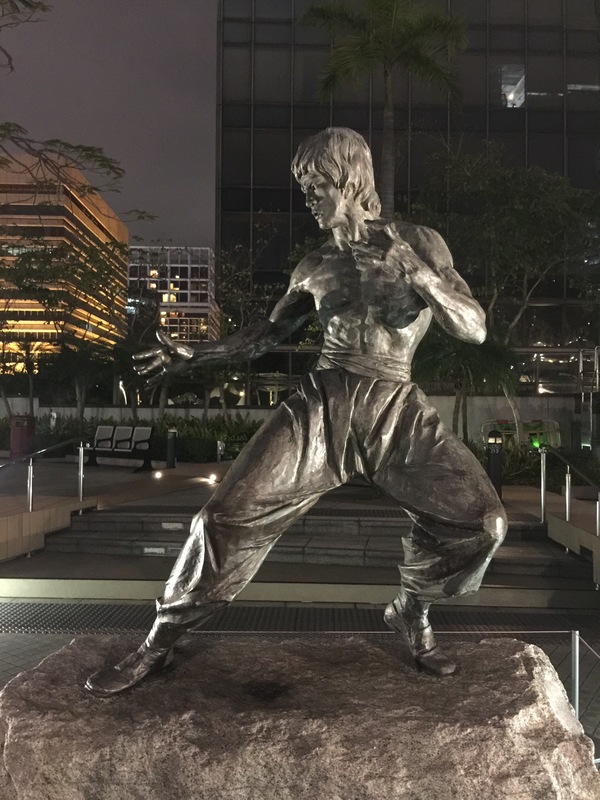 We headed back via the garden of stars and found famous Chinese and Hong Kong stars hands in concrete and statutes of people like Bruce Lee (who was from Hong Kong) – admittedly apart from Jackie Chan and Bruce Lee we’d never heard of any of them! In the morning, we hiked with our backpacks through the central city. The hotel was relatively easy to find and was located on the 12th floor of a building on the main shopping street. I say hotel, but really it was more a converted flat into lots of small rooms. Our room was a disaster. Located in the main reception. The door was no more than 2 feet away from the front desk. Even with the door closed we could hear every single conversation and phone call crystal clear. We complained but where told there were no more rooms. Our most urgent assignment was laundry. 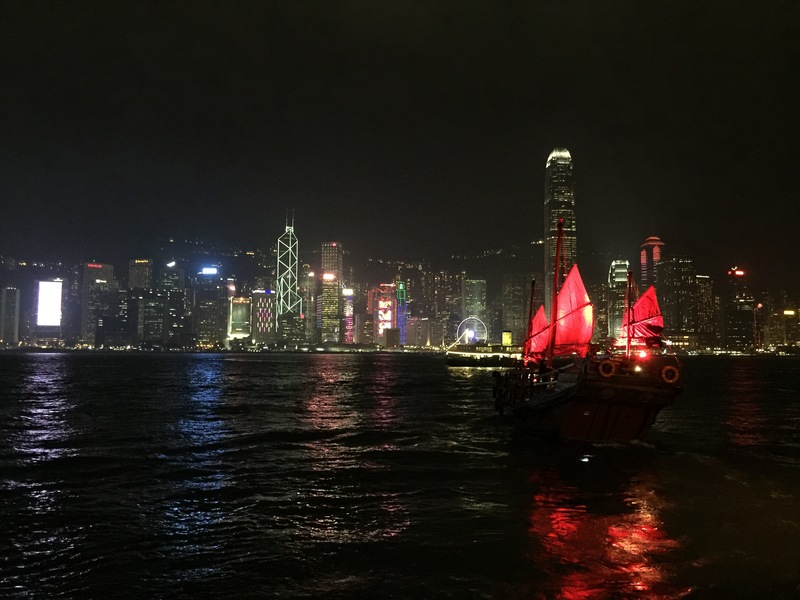 Compared to an expensive service wash in Delhi, an arduous self wash in Beijing and countless buckets and showers, Hong Kong was a dream! 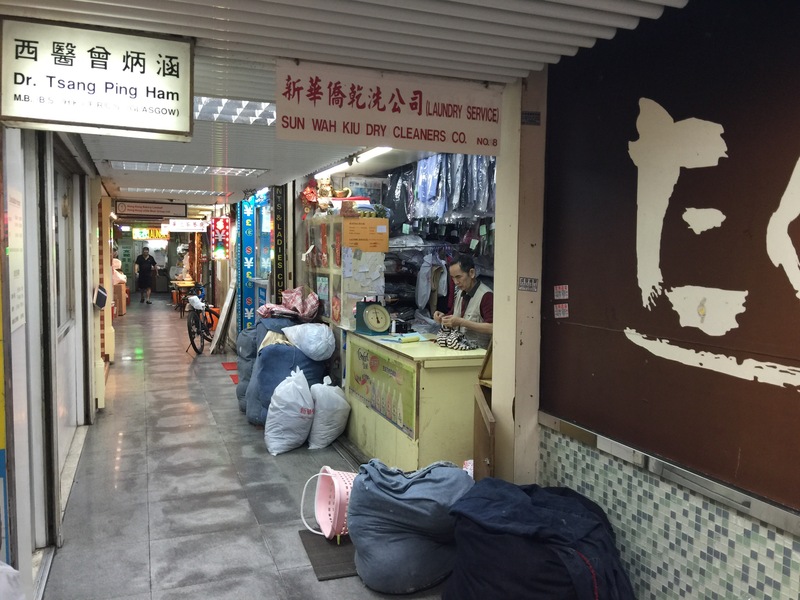 8kgs of washing – practically everything we owned was washed, dried and folded in 5 hours for just 90 HKD (£9.50). We explored the streets and headed back down to the water to take some pictures during daylight. We scouted out ferries and prices ready for our friend Sam to join us the following day. We held off on the big activities like Victoria Peak so we could experience them together.